Trees are all around us. They come in many different shapes, sizes, and even colors. Some remain green throughout the year, while others have leaves that change colors and fall to the ground. 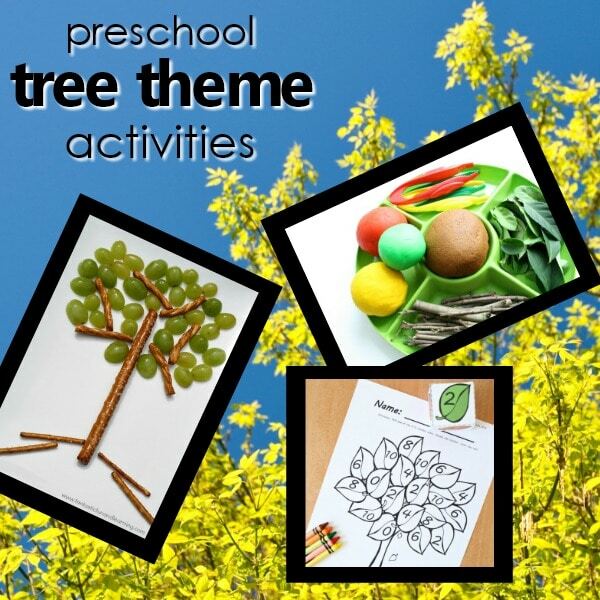 Tree theme preschool activities can be a fun topic to explore year round. Here are some fabulous resources for planning your preschool tree theme. Most of these activities are designed for kids ages 3 through 5, but many can be modified for younger and older kids as well. A preschool tree theme provides lots of opportunity to get outside and explore nature! 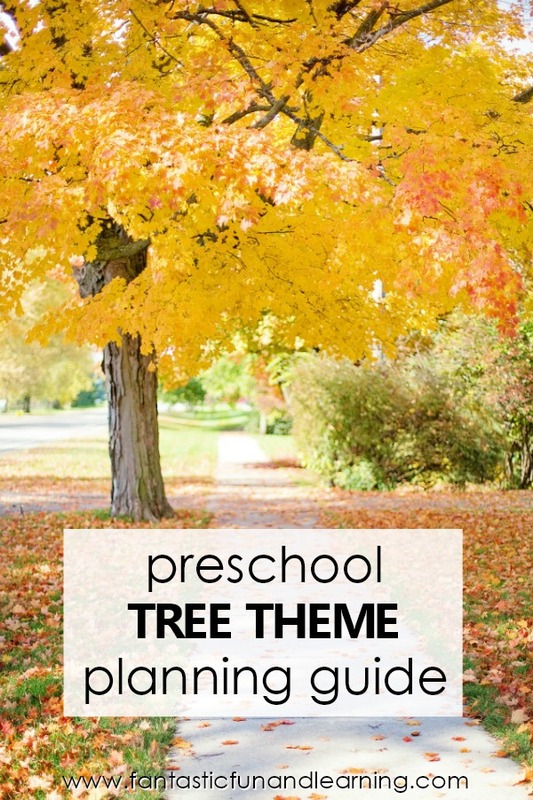 Studying trees can also lead to discovering habitats and the animals that may call trees “home.” Whether you’re looking to compare evergreen and deciduous trees, tree habitats, or the seasonal changes that some trees undergo, a preschool tree theme provides lots of fun investigative learning. A tree theme can be taught any time of year. In some places, trees change throughout the year and can be incorporated into any seasonal learning theme. You may choose to explore trees during spring as new growth occurs or in fall as the temperatures are shifting and the leaves begin to fall. If you’re planning a preschool tree theme there are many possibilities for incorporating meaningful early learning skills. You can also use real leaves or sticks as manipulatives for many learning activities to teach math and literacy concepts. If you get parents, friends, and family involved you can enrich the experience kids have during your preschool tree theme. Here on Fantastic Fun and Learning we’ve shared the following ideas to go along with a preschool tree theme. 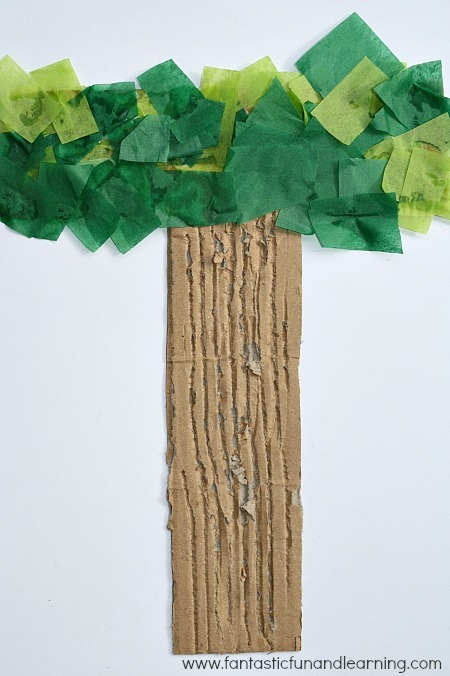 Try out this fun alphabet tree craft to represent the letter “T.” Kids will love scraping forks across the cardboard tree trunk to make it look like real bark! 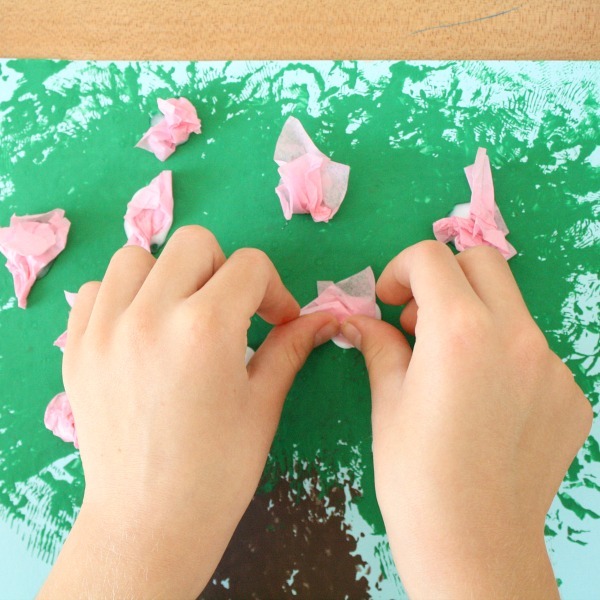 Grab some pipettes and food coloring to make a fall tree crumpled art creation. 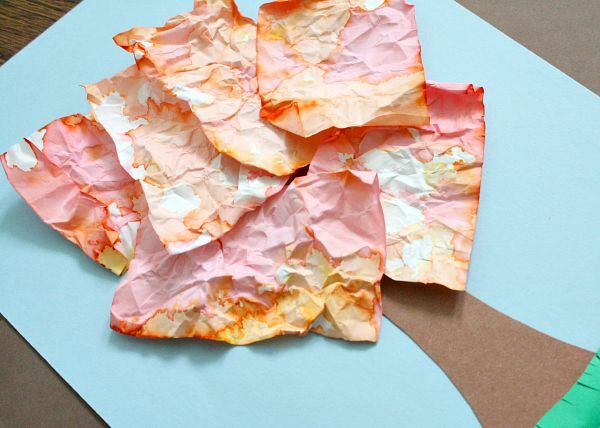 Kids will love getting to crumple up paper and squirt fall colors. Show off some vibrant fall colors and create a tissue paper fall tree with some bleeding tissue paper. 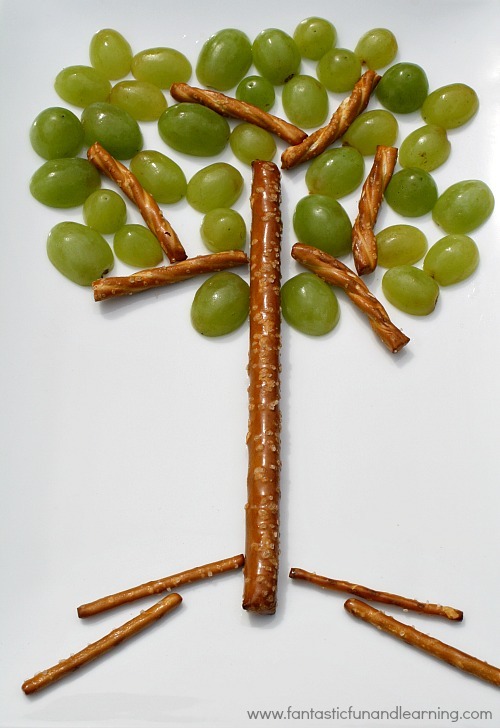 Create a healthy tree snack that is sure to be a hit with some pretzel sticks and grapes. Add a fall twist to this create your own tree snack by substituting the green grapes for red and yellow cherry tomatoes. Welcome spring with this fun spring tree art project. 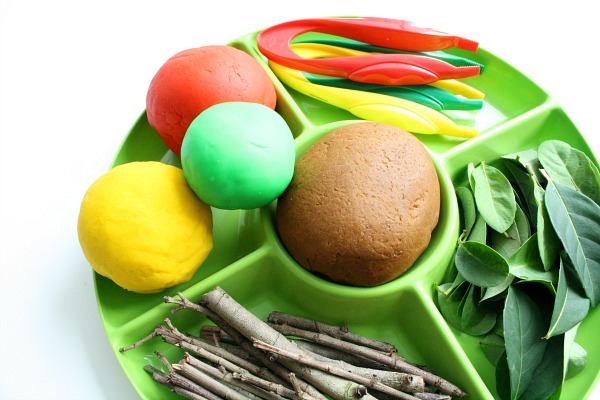 Continue learning about signs of spring with this spring tree play dough set. 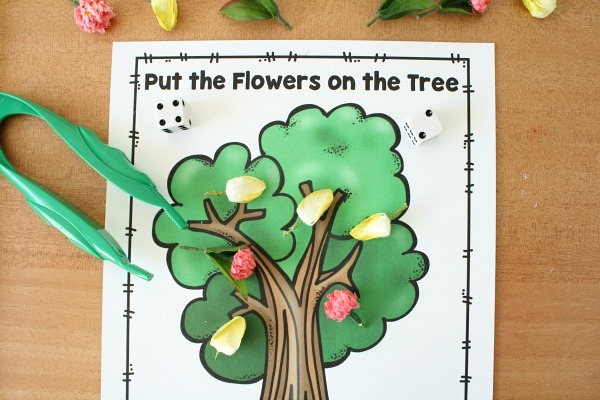 Practice counting, addition or subtraction with this free printable tree math activity. Create a loofah painted fall tree craft project. Experiment with stamp painting in this fall tree art project. 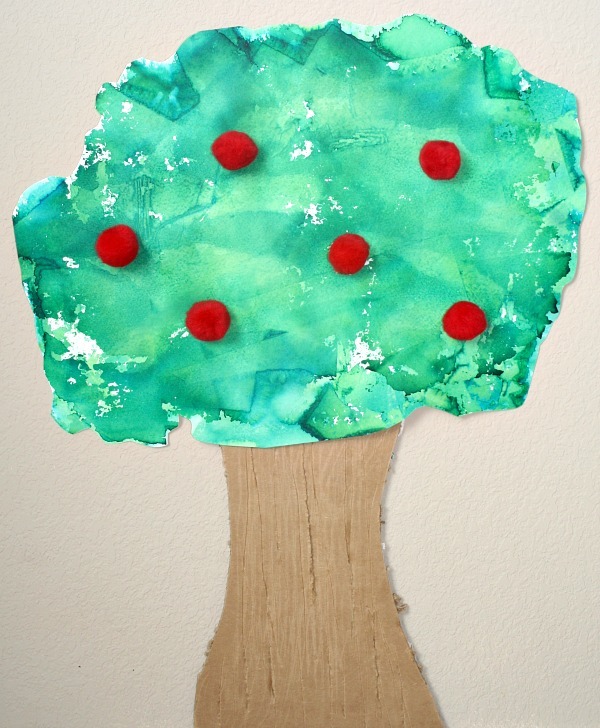 This tissue paper tree art uses bleeding tissue paper and red pom poms to create a hands-on apple tree craft. This hands-on sensory invitation to create an apple tree will fill your room with sweet hints of cinnamon too, as you use cinnamon sticks for the tree stumps. Grab some natural materials and some playdough and create some apple trees in this hands-on way. Go for a nature walk and collect some twigs. Use them to create this winter tree art project. 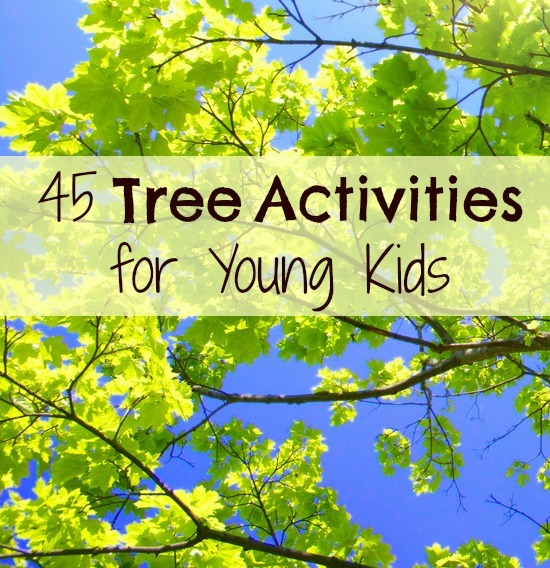 Check out these tree activities for children that include 45 science investigations, sensory play, literacy activities, and math! Add some science to your tree theme with these forest science activities. PBS Parents provides some useful tips and tricks for identifying trees while hiking with children. Learn about different types of trees, leaves, and seeds with Curious George. Discover what a tree needs and the different habitats they live in. Be an evergreen detective and discover how to identify various evergreen trees. Learn how evergreens grow and how some survive harsh weather conditions. Learn about the parts of a tree while singing to the tune of Head Shoulders Knees and Toes. Kids will love watching the seasonal transformation of trees. The Green Grass Grows All Around helps teach parts of a tree. Learn about trees, roots, trunks, and trees. Finger plays and action rhymes are a great addition to your preschool themes. Here are a few terrific options to go along with a tree theme. 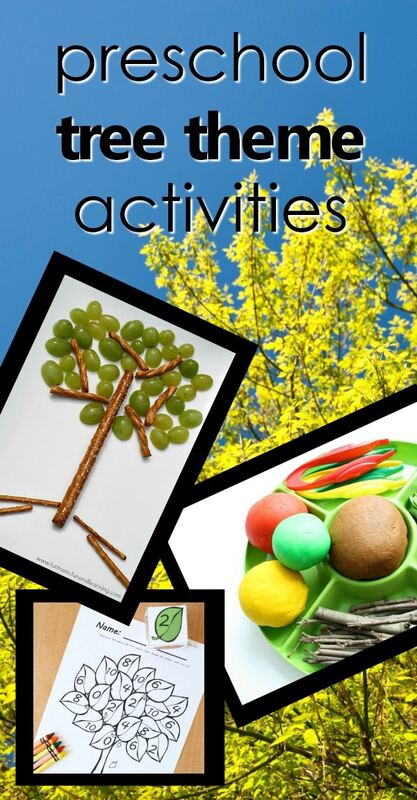 Create some acorn finger play props to sing and enact 5 Little Acorns Sitting in a Tree. Down by the Tree Farm is a catchy song and action rhyme sung to the tune of Down by the Bay and featured by Growing Book by Book. Play a game of tree memory from National Geographic Kids by uncovering and matching trees. Test your knowledge on trees with these fun games about trees from the Arbor Day Foundation. You’ll find fun and challenging games such as Treevial Pursuit, ConcenTREEtion, and jigsaw puzzles to name a few. These tree games will have you learning about the parts of trees, identifying trees by their leaves or fruits, and matching wildlife that may inhabit them. There are a ton of wonderful books to read for your tree theme preschool activities. Below are some of our favorite picture books for a tree theme. Check out some of our favorite books about trees that include fictional stories and poems about trees that are sure to enhance your tree theme. If you’re looking for books about fall during your tree theme, some of our favorites include great books that touch on leaves and the change that trees go through during this season. Exploring the rain forest habitat? You may find this book list about the rain forest helpful in your tree theme as you explore the different types of trees that host animals for their homes. 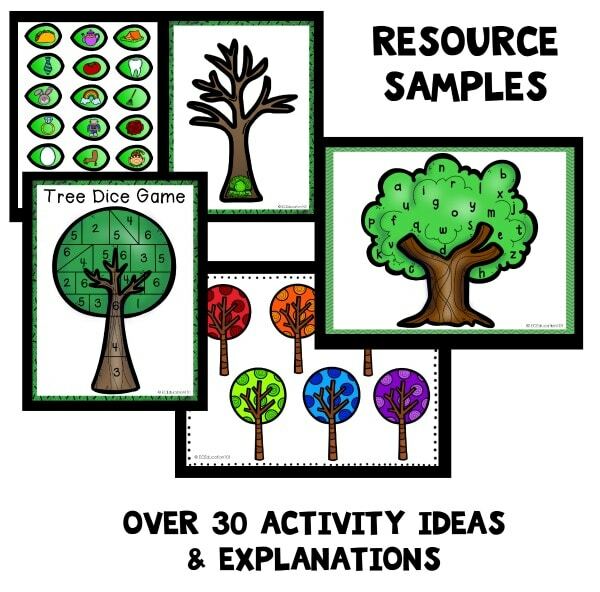 Reinforce learning with these hands-on materials for your tree theme. They can be used for sensory bins, crafts, and learning activities. This roll and color math printable is great for adding small numbers or practicing doubles. It fits in perfectly with a fall tree theme. 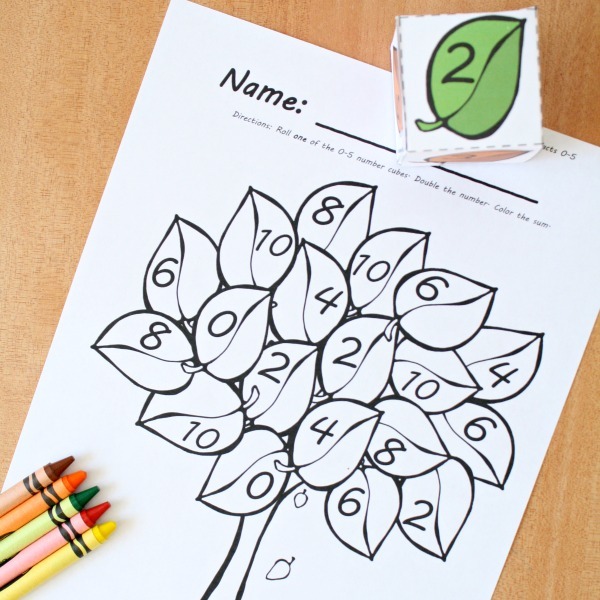 Practice fine motor skills and basic math skills with this apple tree fine motor math activity from Fun-A-Day. As you wrap up your tree theme preschool activities take note of what the kids were most interested in throughout the theme. Continue on by investigating one of those concepts more in depth. Below are some possible suggestions. Themes we have printable lesson plans for include links after them. Forest Animals-lesson plans available for home preschool and preschool classrooms. Leaves-lesson plans available for home preschool and preschool classrooms. Flowers-lesson plans available for home preschool and preschool classrooms. Seeds-lesson plans available for home preschool and preschool classrooms.